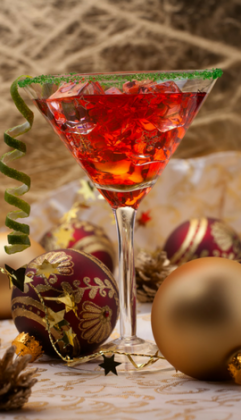 Forget about dressing the Christmas tree in your bar this season, it is all about garnishing your drinks to make them stand out this festive season. Garnish – why do it? With over 75% of consumers saying that, aside from taste, presentation is what makes a perfect drink, making an impression links directly to making a profit. Around a third of customers entering a bar are undecided about what they’re going to order, so your ability to impress and offer expert advice is key to unlocking potential sales. Seasonal serves can boost your bar’s reputation and go a long way towards attracting new customers. Creating fresh and interesting seasonal drinks is a simple way to engage customers, driving your sales by satisfying their desire for treating themselves. Your seasonal drinks don’t have to be complicated and a great way to give your cocktails a seasonal twist is garnish. Not only can this garnish give your everyday cocktail a point of difference for the season but it can also give you the opportunity to charge more. A few simple changes to the presentation of your long mixed drinks can give your bar a competitive edge. Citrus fruits add colour, flavour and a ‘zing’ of acidity – limes, lemons and oranges are the basic fruits. Use oranges for orange flavoured drinks, lemons for lemon flavoured drinks and limes for everything else. Use wedges instead of slices as these can be squeezed to add extra flavour. As well as adding to the flavour, adding peel provides an additional ‘visual’ dimension. Only cut the fruit you’ll need for the shift – And use a non-serrated knife and a wooden board. Never keep your pieces of cut fruit in a bowl of water as it dilutes their flavour. Stir a handful of cranberries into your SMIRNOFF NO.21 Vodka and cranberry. A fresh stalk of rosemary into your JOHNNIE WALKER hot toddy. Grate chocolate flakes into your BAILEYS serves. Add a cinnamon stick to your eggnog recipe. Make a menu – Create a special menu of your seasonal serves, complete with mouth-watering descriptions and images. Make it special – It might be grating some cinnamon onto the finished drink. Or adding chocolate flakes, a handful of juniper berries or star anise. Be open to experimenting with flavours and textures. Go local – With seasonal, locally produced ingredients such as soft fruit garnishes. Explore the opportunities to go local – ‘local’ says ‘fresh’ and can save you money. Join the conversation and tweet us at @diageobarac, on Instagram @diageobarac or like us on Facebook – we’d love to hear from you!